It’s no secret that retired seniors are exploring the world, and it’s happening in more ways than one. Many seniors are choosing to stay within Canada this summer. According to the Canadian Camping and RV Council (CCRVC), 37% of Canadian campers are opting for an RV road trip, and 24% are seniors 55+. Not only is it a fun, spontaneous way to explore the country, RVing in Canada is significantly cheaper than staying in hotels. 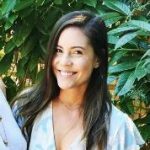 As an RV beginner, it can be daunting to decide on an affordable RV rental, and to know what to look for during your search. Before deciding whether RVing in Canada is for you, you need a valid driver’s license, and you need to be comfortable driving a large vehicle on public roads. Make sure you evaluate your capabilities and physical health before you set out. Next, decide on a budget, and be prepared to track every expense. If an RV road trip sounds like an adventure for you, read on for some money saving RV travel tips and advice to ensure a successful vacation. If you’re RVing on a budget, renting is the way to go. When you rent an RV, be prepared to pay roughly $1,000-$1,200 per week for a 25-foot class C motorhome with unlimited miles. Motorhome rentals typically come fully equipped with kitchen utensils, plates, glasses, cups, cooking pots, towels and bedding, so leave those items at home! Opt for trusty RV dealers to ensure you’re renting a well maintained vehicle suited to your trip, all while paying a competitive price. Ask the dealer as many questions as possible to make sure you get the best RV for your needs. This way, you’ll have access to great RV travel tips on everything from how to use the vehicle safely, which routes to take, best camp sites and even suggested meals to pack. Not sure which type of insurance you’ll need to go RVing in Canada? Rental car insurance is a must before driving off on the road trip of your dreams. Call your auto insurance agent to find out if your existing policy covers the deductible or any damages to rental vehicles. Many auto insurance companies cover your risk when renting a car, but motorhome rentals may be a whole different story. 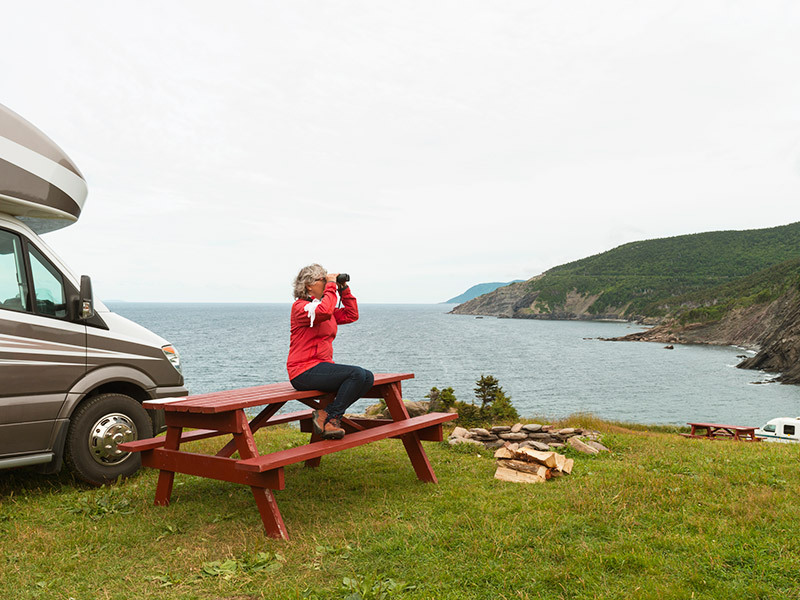 Don’t miss our full list of travel insurance options available for RVing in Canada. Choosing the right RV and RV insurance for your needs is important to save money in the long run. If you get into an accident, many types of insurance will play a part. Emergency medical insurance is a must for covering health issues. Having health coverage will make sure you get timely medical care in a different province or country and will save you money on out of pocket expenses in case of a medical emergency. When choosing your motorhome rental, test drive it to make sure everything is in good working condition. You want to rent an RV that is big enough to enjoy, but not so big that it’s hard to drive. Be aware of your height and length to avoid overhead obstacles and allow enough room to turn. Remember, the smaller the RV, the lower your gas bill will be, and you’ll spend less time and money on heating, cooling and overall maintenance. When you’re RVing on a budget, buying food on the road can get expensive. Pack snacks and meals to ensure you have healthy, affordable food at all times. Plan your meals ahead, and buy canned and dried foods when they’re on sale to avoid taking up valuable fridge space. TIP: Use a slow-cooker to prepare the majority of your meals. It makes the meal convenient, mess free, and you’ll definitely have leftovers for the next day. Driving 80-90 km (55 mph) is optimum for saving gas – slow and steady wins the race! Try to keep your electricity use to a minimum, and fill up your tank on weekdays rather than weekends. When opting for the RV life, take it slow to make the most of your budget and experience. If you’re not sure where you’re going, you’ll end up wasting gas. Invest in a GPS with an RV-specific route planner to factor in overhead clearance and other restrictions, such as which roads, bridges and tunnels won’t allow propane tanks through. Also, most RVs and campervans don’t perform well on poor roads, so keep a close watch on road conditions and updates when driving or planning your route. If you’re planning on visiting multiple RV camp sites and cities, an RV membership may be the best option for you. Discount clubs offer generous savings at select stores, gas stations and RV camp sites, with numerous spots to choose from across Canada. Many parks offer senior passes, which usually offer 50% off discounts on all camping fees. 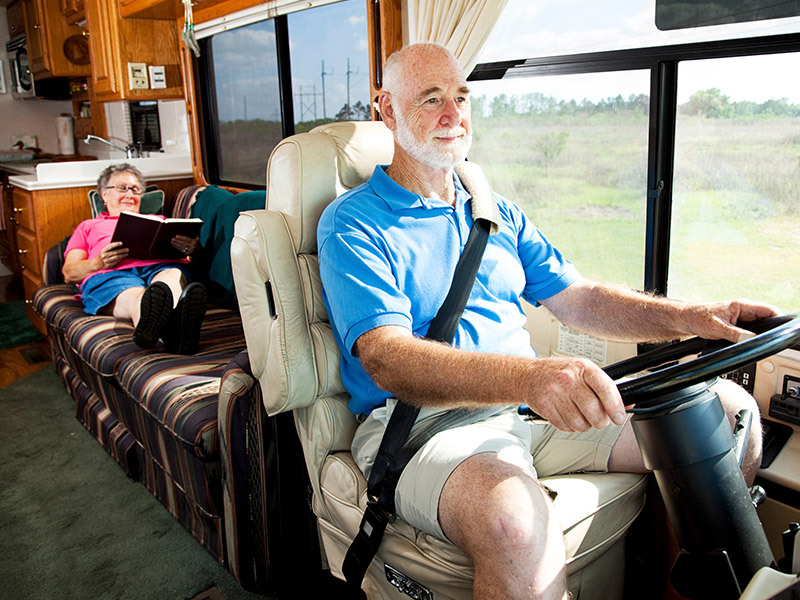 Learn more about RV camping tips for seniors. Now that you’re equipped with these RV travel tips, hit the road less travelled and road trip like a pro! Have more questions about RVing in Canada? Leave a question below!